:: Question of the Day: My lips are so dry and cracked, what do I do? Yes, believe it or not, I am back to work! I had a terrific time in Colombia. Be sure to wear red for good luck that day! Indulge with our decadent Chocolate Raspberry Truffle Facial without adding a pound! Soothing shea butter cleanser, and a great raspberry enzyme anti-oxidant treatment to exfoliate dead skin cells and rejuvenate tired skin. We will massage all of your worries away with a chocolate body butter and then end with a scrumptious chocolate mousse mask. You will smell good enough to eat! 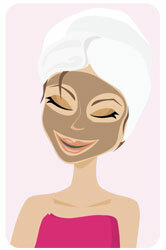 Do not miss this delicious facial for only $65 - Aren't you worth it? This is also a perfect gift for that special someone this Valentine's Day. Purchase a Chocolate Raspberry Truffle Facial for $65 and add our Luxurious Champagne and Roses Goody Basket for only $35 (a $50 value!) Chocolate, Champagne and Roses - you have everything covered! Limited Supply Available. Single and loving it (or maybe faking it)? Who cares if you do not have a significant other to buy you a gift certificate? (Or you have a significant other who isn't taking the hint?) Be your own Valentine and treat yourself! You know you deserve the very best! I ndulge with our Champagne and Rose body products. Keyano Aromatics is the baby of Bill Comiskey, a Naturopath. He is devoted to the manufacture of one of the finest environmentally conscious salon and spa product lines available on the market today. Embracing the holistic wisdom of ancient cultures, the knowledge behind Keyano has been gathered from top therapists and healers around the world. We have a limited supply of these items so be sure to shop well in advance of Valentine's Day! Mark Your Calendars - It's A Beautiful Benefit on March 1st! Saturday March 1, 2008 from 12-3pm - Adult Skincare and Colorescience Makeup Fundraising Event! Learn about skincare and make-up with Raspberry Moon, with the proceeds benefiting Soroptimist International as we usher in Woman's History Month. We will have a delicious English Style Tea at Loralee's Tea Room. Soroptimist means "the best for women." Soroptimist International is the largest professional women's service club in the world committed to enhancing the lives of women and girls. Alison Lively from Creative Health will be talking with us about nutrition and the skin. Marina Panon will be talking about Acupuncture and its benefits for your skin. Paige Floyd with Colorescience will be wielding her magic with Colorescience Mineral Make-up and explaining the benefits of using mineral make-up vs. traditional make-up. I will be discussing the importance of proper skincare and launching a brand new skincare line! Goody Bags for all who attend and for the first 5 people who pay and register you will be presented an extra special treat! The cost per ticket is $40 with half of the proceeds going to Soroptimist International. There are a limited number of seats available so be sure to book today! Animal Allies Spay and Neuter Clinic announces reduced spay and neuter surgery prices during February for their "Beat the Heat" promotion. Spay surgery for your female cat is $15, and for female dog is $25. Get your female pet spayed today to prevent an unwanted litter later in the spring. Call today, 576-6971, slots are limited. Animal Allies operates a high quality, high volume, low cost spay and neuter clinic. Our mission: Providing an opportunity for all Spartanburg and surrounding area residents to access a quality spay/neuter program for dogs and cats. Spay and neuter is the most effective way to reduce the number of stray and unwanted pets. Good news! Abuelita had surgery on the brain tumor last week and the doctor was very happy with how it went. She was in intensive care for a few days and is now in a regular room. She will be going home soon with a 24/7 nurse but she is doing very well! Paola and her family thank you all very much for all of your prayers/well wishes and thoughts. Question of the Day: My lips are so dry and cracked, what do I do? You could be dehydrated. Most of us forget to drink enough water when it is colder so try to get your water intake up. The air is drier from the heat so a humidifier is a good idea. Use a gentle exfoliator like sugar on the lips and then apply a lip balm rich in shea butter, Vitamin E and other natural oils like Jojoba, Sweet Almond etc. Be sure to stop licking your lips! This aggravates the problem by drying them out more. Sun and cold weather can also destroy your nice soft lips so be sure to always sun protection on your lips. Some long lasing lip polishes can also cause dry, cracked lips. You may need to take a break every few days from long lasting polishes. You may also want to speak to a Nutritionalist - you could be low in Vitamin B.
Colorescience also makes a wonderful Lip Polish Remover that is a great gentle exfoliator and then you can use our lip serum to hydrate. Purchase a Lip Serum for $25 and receive a FREE Lip Polish Remover through the month of February and only while supplies last. Resolve to Pamper Yourself this Year - At Home, Too! 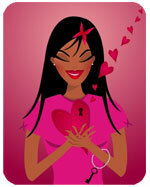 Open Your Heart for Love - All of us have had hurt feelings from family, friends and significant others. Some of us hold onto things longer then we should. Use the formula below to help release those feelings so you can receive love during this month of love and romance. Take 20-30 minutes of quiet time to reflect on the people and hurt feelings that you need to let go of and relax. You can apply this formula to your wrists, upper chest and the back of the neck. Be sure to take deep breaths to inhale these powerful vapors. You can also make a Mist Spray and spray several times over your head with your eyes closed and breath in deeply. So open your heart and release yourself! Out of the office - Believe it or not I am in town the entire months of February and March.